Attacking the 15-year Congress rule in Assam and former Prime Minister Manmohan Singh, who represents the state in Rajya Sabha, over “lack of development”, Prime Minister Narendra Modi on Tuesday launched Bharatiya Janata Party’s election campaign by announcing a slew of initiatives, including tribal status to two communities. Addressing a rally, organised jointly by BJP and its new ally Bodoland People’s Front for the upcoming Assam assembly polls, he said BJP will ensure all-round development of Bodoland Territorial Council areas which have been “betrayed” by Congress. “Why does Assam have so many problems when the same government is there for 15 years and the state has sent a prime minister for ten years.... They could not do anything in 15 years and now they want me to solve all their problems within 15 months.... Don’t you think its unfair to me,” Modi said. “There is a long list of problems. There has been no development,” he said addressing the rally at Bodofanagar. The prime minister came down heavily on the Congress government in Assam and the previous UPA government at the Centre for “failing” to fulfil dreams and aspiration of the people. “They are asking questions about my government. But what have you done in last 15 years in Assam and 10 years in the Centre when a person representing Assam was the prime minister,” he said, referring to Singh. “They are just trying to confuse the people. You compare their 15-year rule and my 15-month-old government. You will see the vast difference,” he said. Modi announced that the people of Karbi community living in the plains of Assam and Bodos living in hill areas would be granted tribal status and the process has already started. “Development is the only solution to all problems of the area and I have opened both my heart and hand to ensure that the dreams and aspiration of the people of the area, which the state government has failed to fulfil, are realised,” Modi said. The prime minister said he had instructed that youths from the Northeast should be recruited in the Delhi Police and the process has already began. Kanchenjunga Express will be extended up to the BarakValley while the RupsiAirport in Dhubri will be taken over by the Indian Air Force. Election to Assam’s 126-member assembly is expected to be held in April-May along with four other states. The BPF is believed to have strong presence in Kokrajhar and its neighbouring areas. 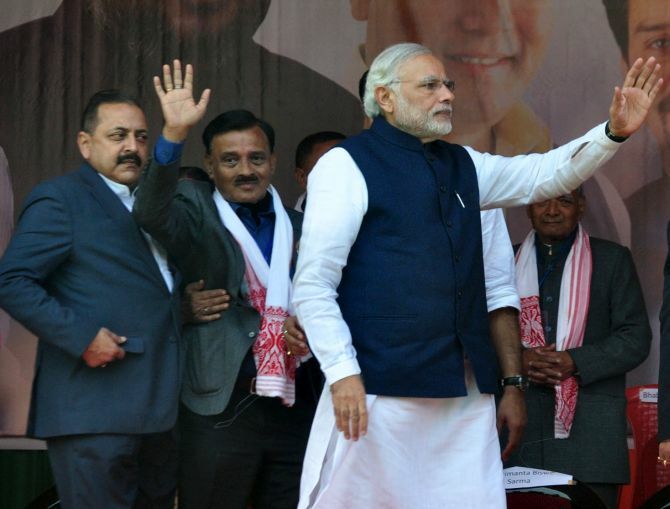 The party has been in power in Bodoland Territorial Council since its inception in 2003. In the 2006 assembly polls, the BPF had won 11 seats and joined the Tarun Gogoi-led government as a Congress ally. In 2011 polls, it had won 12 seats and again joined the Gogoi government. However, in 2014, BPF broke off the alliance with the Congress. Quoting late Prime Minister Rajiv Gandhi, who had said that for every rupee one that is sent from the central government, only 15 paisa reaches the place where it is meant for, Modi said he was right and “we cannot allow it”. “Delhi now asks state governments for accounts. They have to account for every rupee spent. Looting of people’s money has to stop,” the prime minister said. Assam government and several other states in the Northeast get perturbed whenever he sought accountability of the development funds, Modi said. “Assam government has to give us details where the money meant for development has gone. All governments in the Northeast have to give full accounts. Because of this reason, these people don’t like me. But I am not bothered. Whether they like me or not. I work for the country, I work for development,” he said. Modi said ever since the NDA government came to power, the ministry of development of North Eastern region has taken several initiatives and now at least one minister of the central government visits the Northeast every month. “We have a three-point programme -- development, development and development. All problems could be solved only through development,” he said. The prime minister said his government’s aim is to provide electricity to every household 24 hours, every family a house, a toilet and potable water by 2022. He said the DONER ministry was started by former Prime Minister Atal Bihari Vajpayee but during the UPA rule people of the region had to go to Delhi and they found it very difficult to get their grievances redressed. “To solve this problem, I have directed the DONER ministry that its entire secretariat would meet once a month in any North Eastern state where people can come to discuss their problems and the state have been asked to give a detailed account of the funds allotted to them,” he added. “I am not bothered if people do not like me but I am bothered about my country’s progress and development and I work to achieve that,” the prime minister asserted. During the recent recruitment in Delhi Police, it was ensured that youths from the North East were given priority and many have been appointed from the region, he said. He said his government was committed to development of the North East and was implementing ‘Act East’ policy with emphasis on infrastructure development, particularly road, rail and waterways. 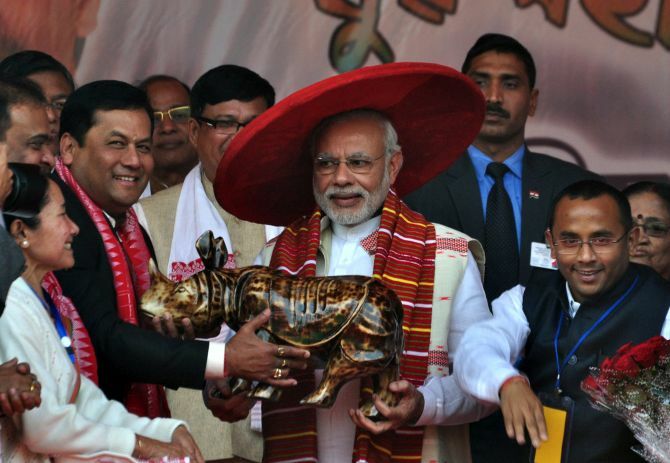 The prime minister announced that the issue of declaring the Bodo-Kacharis living in Karbi Anglong and Dima Hasao districts and the Karbi-Mikirs in the plains as Scheduled Tribes will be soon approved by the Cabinet and then passed in Parliament. Modi said he had talks with BTC Chief Hagrama Mohilary on the problems of the area. “I assure you that your blessings give me the strength and inspiration to serve you and with our new ally, the BPF. We will bring development in the area,” the PM said. Continuing his tirade against the Congress government in Assam, he said it is surprising that those who should be giving an account of their performance are asking questions. “Actually by asking us what we have achieved in 15 months, they are admitting that they have a document of long list of failure,” he added. Later, addressing a ‘Youth Rally’ in Guwahati, the PM asked why Assam continues to remain backward despite Congress ruling the state for so long. “Assam has plenty of natural resources. It has enough of water to generate hydro-electric power but people of the state do not get 24-hour electricity. Who is responsible for this,” he asked. Modi said his government has taken it as a priority to develop the entire eastern India, including Assam, in all spheres as the region continues to remain backward despite having rich natural resources. “If Mumbai can develop, Guwahati can’t remain backward. If Ahmedabad can develop, why can’t Assam develop. India will not develop unless the eastern India is developed too,” he said. The PM asked why after so many years of Congress rule in the state as well as at the centre, the gauge conversion of railway track was not completed in Assam. “If there is no gauge conversation, how the development would come. What did they do in so many years? But we have given maximum funds in last railway budget for Assam and other states of the Northeast. For development of road network also, maximum funds were given to the region. We have formulated the ‘Act East Policy’ for the benefit of the entire region,” he said. Modi said India is a country of youth as majority of its population is below 35 years of age and hence welfare of youth is a must. “For Congress, youth means the sons and daughters of its leaders,” he said. The PM said most of the rating agencies in the world -- be it World Bank or IMF or any other -- have termed Indian economy as the fastest growing in the world. “India is developing at a fast pace. There has been an increase of 40 per cent in FDI. If FDI is coming, there will be more industry and more industry means more jobs for youths,” he said. Modi also highlighted various development initiatives taken by his government in last 18 months rule that include Pradhan Mantri Dhan Jan Yojana, Mudra Bank Yojana, saying these were beneficial to the downtrodden, particularly the SCs and STs.